You’ve got to feel sorry for Pont Saint-Jean. 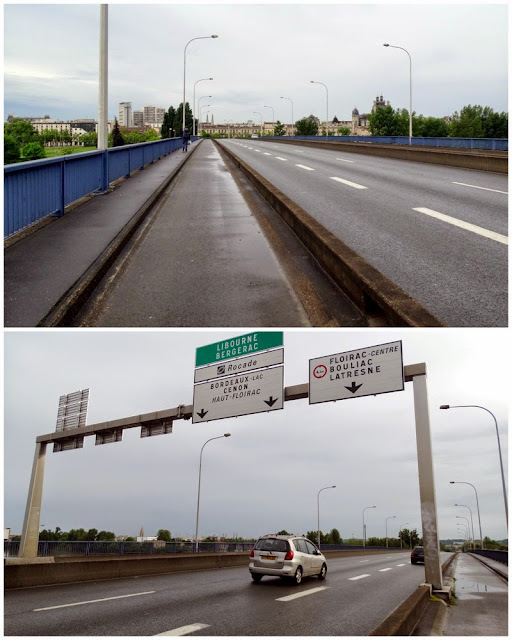 In the unwritten hierarchy of Bordeaux’s road bridges, it comes very much at the bottom of the table, far behind the elegant Pont de Pierre, the slick Chaban-Delmas lift bridge, the wondrous Pont d’Aquitaine suspension bridge and the minimalist Pont Mitterrand. In the otherwise flawless “Dictionnaire de Bordeaux” it doesn’t even get an entry. 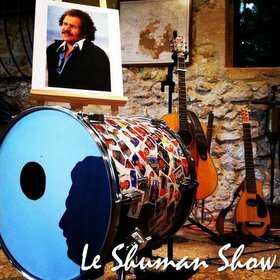 Let’s face it, if Pont Saint-Jean were one of the Beatles, it would be Pete Best. The unloved edifice was the result of a relatively short process which began in 1962 with an initial call for tenders to deliver a bridge to connect Quai de Paludate (near Saint-Jean railway station on the left bank) with Quai Deschamps in the right-bank Bastide quarter. Campenon Bernard, a company which is now part of the Vinci group, were selected and they teamed up with the architect Jean-Louis Fayeton (1908-1968). Construction work began in April 1963. The whole endeavour was subsequently executed so swiftly that it went almost unnoticed in Bordeaux while most attentions were focused on the more complex and ambitious Pont d’Aquitaine project further downstream, which had been in the pipeline far longer and yet would only be delivered in 1967. So, upon completion, Pont Saint-Jean was just the second road bridge to span the Garonne in Bordeaux. 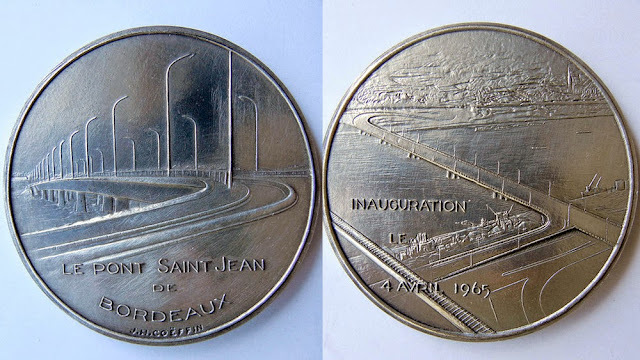 The no-frills bridge was officially inaugurated on April 4th 1965 by France’s Interior Minister Roger Frey alongside Bordeaux mayor Jacques Chaban-Delmas. While the opening of the Pont d’Aquitaine was an excuse for street parties, dances and much rejoicing (documented in many archive reports), the only remnant of Pont Saint-Jean’s inauguration is an official souvenir coin. The collectable coin, source: Wikipedia. The bridge is very much part of the landscape now. In terms of vital statistics, the pre-stressed concrete structure is 474 metres long and comprises eight spans that rest on five sets of piers. There are three lanes of traffic flowing in either direction, flanked on both sides by a separate cycle lane and pedestrian pathway. The visual delight that is Pont Saint-Jean. From the right bank, most of the incoming traffic flows seamlessly from the high-speed Boulevard Joliot-Curie. Once on the left bank, traffic is channelled onto the perpendicular waterfront road network. Interestingly, that was not the original plan as the bridge should have linked up with a new thoroughfare which would have speedily cut through the city all the way to the modernised Mériadeck quarter. This idea, which would have led to the demolition of countless buildings, was soon abandoned. Visiting the bridge on a rainy Sunday morning for the purposes of this article, I was surprised by how inhospitable the immediate environment is for cyclists on both sides of the river (and how difficult it was to find my way onto the bridge – there is room for improvement as far as the signposting is concerned). On the bridge itself, the most notable feature is the view. Looking south, two railway bridges run immediately parallel to Pont Saint-Jean: Passerelle Eiffel, named after its illustrious project leader and operational from 1860 until 2008, when it was replaced by its neighbour, Pont Garonne. When viewed from Pont Saint-Jean, the two bridges appear to merge into one. Meanwhile, over on the northern flank, there is an almost village-like feel about the city when viewed from the bridge. All-in-all, Pont Saint-Jean feels like nothing more than a functional means of getting from A to B with few taking the time out to enjoy the view, although perhaps the bridge is more meaningful for one person: I spotted a colourful bike lock hooked up to the railings half-way across the bridge. Is this a prestigious bicycle parking spot? 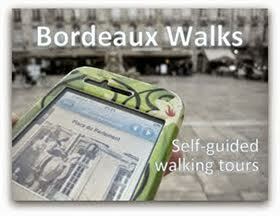 Or does the person leave it there to pick it up on their way into or out of Bordeaux? Or is the lock a romantic symbol which could be replicated by other people, and if so could Pont Saint-Jean be set to become the Bordeaux equivalent of Pont des Arts and its love-locks in Paris? I’m tempted to leave a bike lock there myself to find out whether the idea develops.